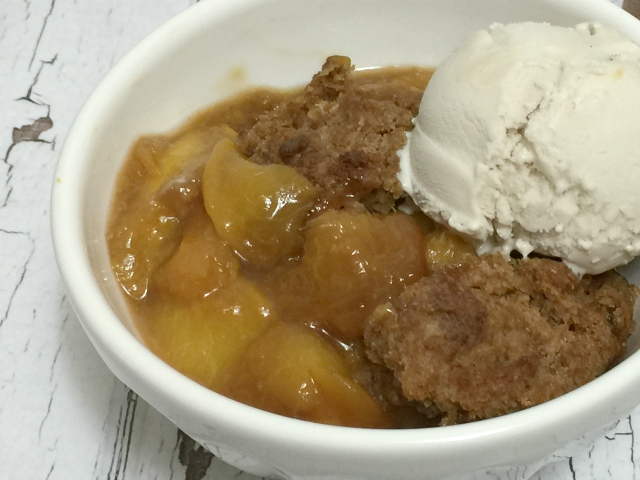 It’s peach season and that means cobbler. 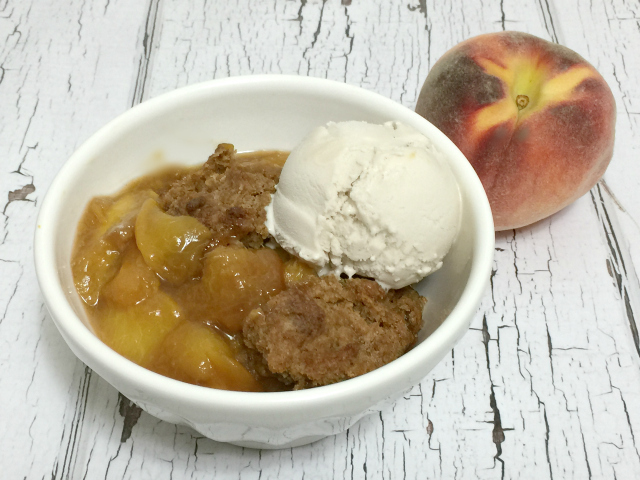 Today I’m sharing my recipe for Bourbon Peach Cobbler made with my favorite peaches, Palisade Peaches from Colorado. This cobbler is very easy to make and is gluten-free, dairy-free, egg-free, refined sugar-free and vegan. You’ll never miss any of these things though! 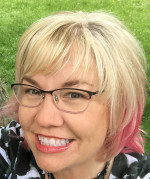 Last weekend I drove to Denver with my friend Laurie. We packed a lot into our short trip, including delivering this sweet mama dog and her litter of tiny puppies to a rescue group who will take the best care of them and find their furever homes. My favorite fella and I foster dogs from our local shelter who need a loving home until they are either adopted or go to a rescue group who can help them over a rough spot. 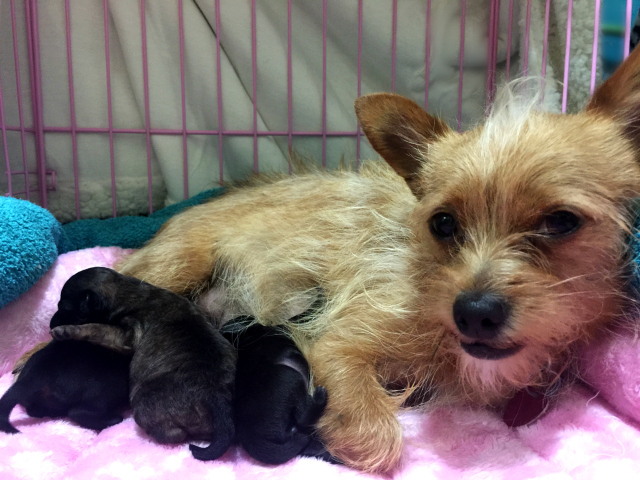 This sweet mama came to us pregnant, but the shelter vet said 7 to 14 days until the babies were born. Ummm…how about 36 hours? That’s how long she was at our house until the first puppy arrived. Having newborn puppies was a new experience for us but mama did a great job and was an excellent car rider with her babies all the way to Colorado. I miss them so much and hope I get to hear more about their journey to furever homes. 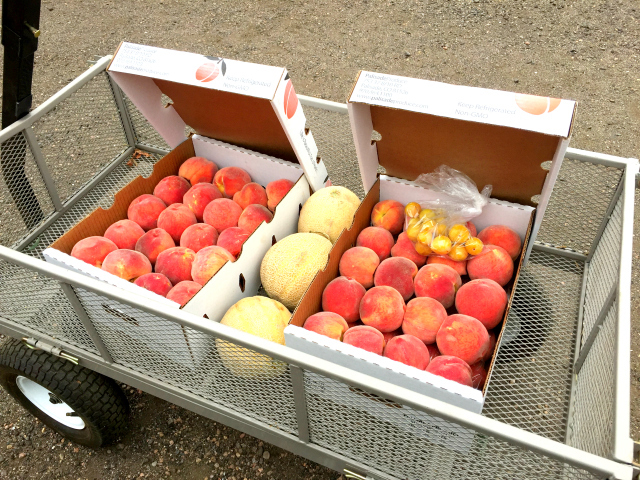 While in Colorado, we picked up a couple cases of Palisade Peaches and some Rocky Ford cantaloupes. My friend Suzanne, a Colorado native, introduced me to Palisade Peaches many years ago. Somehow I seem to end up in Colorado nearly every August and embrace the opportunity to buy the juiciest peaches you’ll ever taste. 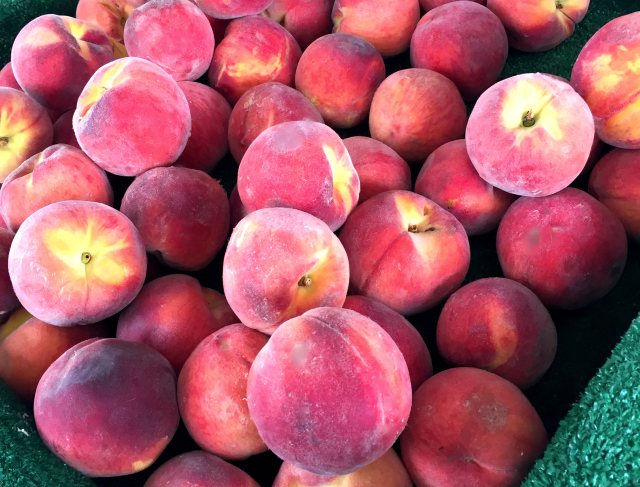 They are a very tender peach and must be handled carefully but bake up into the best cobbler, make incredible peach salsa and are also excellent eating just by themselves. If I could stop making cobbler, I would match a batch of jam. But for now, I’m all about cobbler. So why bourbon in peach cobbler, you ask? Because bourbon and peaches belong together. Seriously. My recipe uses just a touch of bourbon, just enough to add that lightly spiced, caramel flavor of a good bourbon which pairs perfectly with the sweetness of a good peach. But just in case bourbon isn’t your thing (what?!? 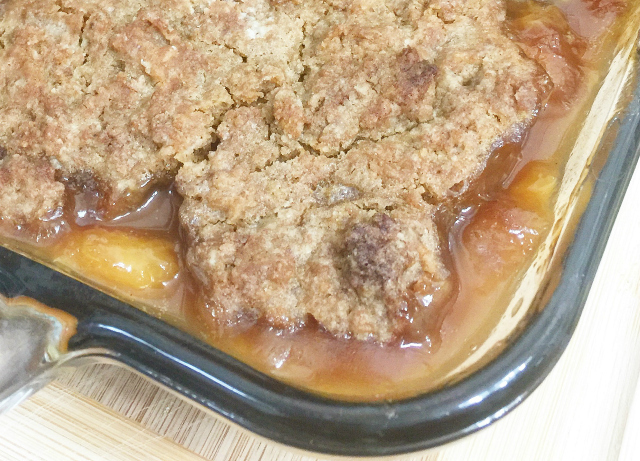 ), I’ve included an alternative in the recipe that makes a good ole traditional peach cobbler. Ready for the recipe? Just click below! I think you can put bourbon in most anything and make it look and taste incredible, Johnna! I was surprised at the alternative to the bourbon though. I was expecting something else caramel-y. 😉 Interesting! I do have a tendency to put bourbon in many things, but it definitely belongs with peaches. Such a wonderful flavor combination! The lemon juice would be the traditional acid in a fruit cobbler and bourbon obviously the non-traditional acid. We don’t tend to think of hard liquor as acidic, I don’t think. Excellent point … I really don’t think of hard liquor as acidic.